I’ve given the classic Snowball cocktail a makeover fit for 2018. Swap your lemonade for prosecco and treat yourself to a Snowflake cocktail! We’ve all got fond memories of the retro cocktail, a snowball. Made with advocaat, lime cordial and lemonade its a wonderful velvety drink that tastes of Christmas. But I think its time the snowball had a makeover…. a millennial makeover to be precise. I’ve spent the whole year fighting off the millennial “snowflake” stereotype but you know what, I am one. I am just one big, walking, talking millennial cliche. Now what alcohol is more millennial than all others? Prosseco of course! So grab yourself a bottle or two and lets get to making a Snowflake. Us millennials may get a bad rap for being lazy and self centred but we do know how to drink. 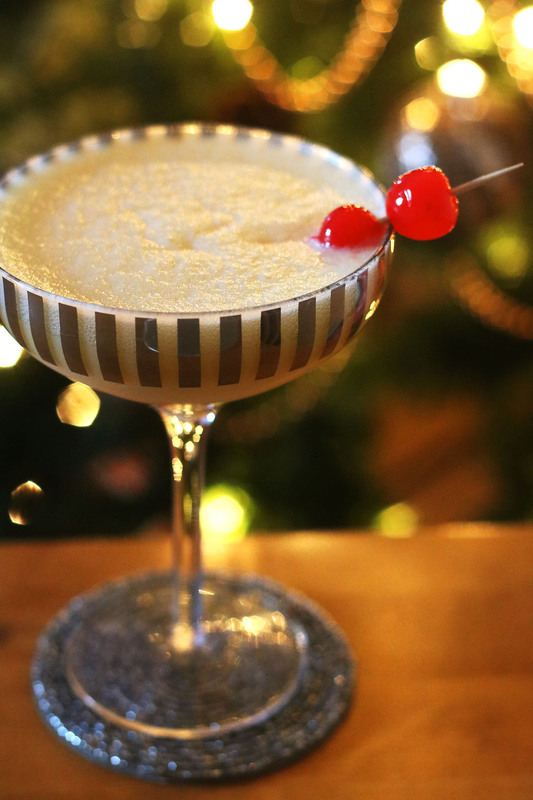 This Snowflake cocktail is rich, creamy and oh so boozy. You might want to take it easy drinking these are they are much more potent than the classic Snowball. I like to serve mine in a coupe glass rather than a high ball. It means you top it up with slightly less prosecco and so they aren’t quite as strong. However you choose to serve them, they are the perfect cocktail for Christmas and New Years Eve parties. Meet the millennial revival of the classic snowball - a snowflake - made with prosecco. This recipe makes 1, scale up if you're making for a party! Place the ice cubes into a cocktail shaker and pour over the advocaat and lime juice. Strain into a cocktail glass and top up with prosecco. Serve with two Maraschino cherries. Thank you so much Alyssa. I hope you have a very happy new year! Mmmm any cocktail with prosecco, I’m in! Ha, I totally do those quizzes, too! Cheers to delicious retro drinks! Glad I’m not the only one Tracy. I’ve lost hours on Buzzfeed quizzes over the years! Looks so fun and fancy! Excited to try this for the holidays. Thanks Matt. Wishing you a happy new year! Such an exquisite cocktail! So festive too! YUMMM!!! Love Prosecco! Perfect for New Years! Thanks Emma!! My pleasure! Enjoy the celebrations. I am so making this! I was given a bottle of advocat and didn’t really know what to do with it. I remember Snowballs being so popular – nice to see it updated for 2019!! I have to admit I got through a whole bottle of Advocaat myself in December. No idea how it happened. Love snowballs and this is just a step up from that. EXCELLENT RECIPE!! !